The Cortland Old Timers Band was a community band that was re-organized in 1967 by John Discenza and Phil Natoli. Their goal was to provide local musicians with challenging and rewarding musical performance opportunities, and to inspire and entertain the Cortland area community with live band experiences. To this day, the band carries on with its original mission. The Band continues to attract both young and seasoned musicians from the Cortland area, which is abound with musical talent and generations of community band heritage. The Band's heritage can be traced back nearly 150 years, when military and industrial bands were popular in the Cortland area. The Old Timers Band had its birth in 1911 as the Mascagni Italian Band, organized by Frank Crisara. While performing for several years as the St. Anthony’s Band (1925 – 1937), and the Cortland Civic Band (1937 – 1958), the musicians found a special appeal in the Italian community and its La Festa celebrations. Frank Crisara also directed the Old Timers Band after its re-formation, from 1967 – 1971. Note: For a school project a few years back, some local students wrote a "letter from Frank" to his relatives back in Italy, speaking as Frank, and talking about starting the band. If you would like to read the letter, please click HERE for a PDF version. In more recent years, conductors have included Dr. Sam Forcucci (1972 – 1993), Donna Yacavone (1994 – 2011), and Edward O’Rourke (2012 – 2018). Beginning in 2019, the leadership changed again, with Nick Pauldine taking over as Director/Conductor, while Michael Poole continues as Associate Conductor. Today, the Band boasts approximately 60 volunteer members, ages 14 to 87, who strive to enrich the Cortland-area community and future generations with their passion for live concert band performances. Their concert selections range from traditional marches, overtures, and patriotic songs, to popular Broadway, movie, and folk music selections. Audiences become connected to the band via the interesting and whimsical background on the music origins, the band members and supporters, as told by the band's announcer, John Folmer (with many thanks to Margaret Perfetti for her many years of services as the band announcer). The Cortland Old Timers Band is a true community asset which provides quality musical performance as a highlight of regional events and celebrations. 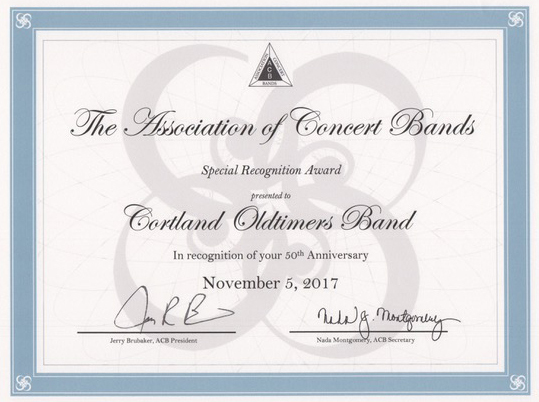 For the celebration of its 50th year in 2017, the band received the following Special Recognition Award from The Association of Concert Bands.